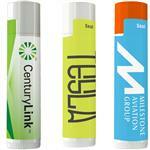 Promotional budget lip balms in white tube as a handy giveaway. This lip balm has a petroleum base with no SPF. This product is USA Made in an FDA Registered Facility. 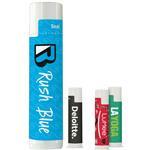 The lip balm tubes are made from 35% post-industrial recycled materials. The tube measures 2 5/8" x 5/8". Similar to common retail lip balms. Comes in unflavored, vanilla and mint. Setup Charges: $45 for a full color imprint. Available Imprint Options: Full Color Imprint. Available in unflavored, vanilla and mint. This lip balm has a petroleum base with no SPF. This product is USA Made in an FDA Registered Facility. 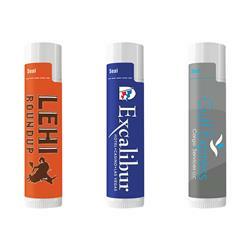 The lip balm tubes are made from 35% post-industrial recycled materials. The tube measures 2 5/8" x 5/8". 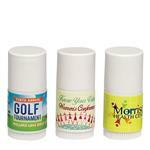 Add your company's logo to this item and order yours today.